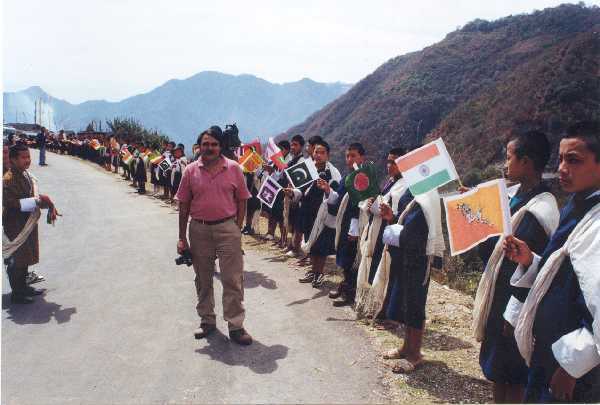 Akhil Bakshi, leader of the HATB expedition, welcomed in Bhutan by children waving flags of south Asian countries. Between March and May 1999, 14 youth leaders of South Asia joined hands together and drove 18,000 kilometers through the interiors of Sri Lanka, Bangladesh, Bhutan, Nepal and 16 States of India to promote peace and development in the region. This historic expedition was organised and led by Akhil Bakshi, President of Yuva Shakti, a Delhi-based organisation of youth leaders. To build an environment of peace and development in South Asia, realising for all its nations and all its citizens a degree of economic and social progress that matches their historic contribution to culture, intellect and liberty. To generate a vision and an energy which will demonstrate to the world the superior vitality and strength of the South Asian nations. To tell the world we are allies in the only war we seek – the war against poverty, hunger, disease and ignorance. To inspire future endeavours to feed the flame that the expedition will kindle. As the expedition journeyed through these lands, the members shared their thoughts, views and dreams with hundreds of thousands of ordinary citizens at over 1000 public meetings and civic receptions in villages, schools and colleges. The expedition presented an Agenda for Friendship titled "Together Towards Tomorrow" to the Heads of States of these countries. "A peaceful environment in South Asia can only be achieved if the people themselves lead the way by going a step further than their governments. Hands Across The Borders is a people’s initiative in this direction," says the leader of the expedition, Akhil Bakshi., who had earlier led the Central Asia Expedition along the old Silk Route through Central Asia, Chinese Turkestan and Tibet and the Azad Hind Expedition, in the footsteps of the Indian National Army, from Singapore to Delhi. Bakshi envisaged this expedition as a mass contact programme. The idea struck him three years ago while driving one night in the Garo Hills of Meghalaya during the Azad Hind Expedition. Over the next few months, the proposed expedition was discussed with a cross section of people and the response was immense and exciting. He visited Pakistan and Bangladesh - and discussed the expedition with friends from Nepal, Bhutan and Sri Lanka and found that his concept of "Hands Across the Borders" was one shared by a vast number of South Asians. The 14-member team comprised of youth leaders, social activists and development workers from Sri Lanka, Bangladesh, Bhutan, Nepal and India. Messages of support were received from the Prime Ministers of these countries. The Expedition carried Goodwill Messages from the Head of the Governments of India and Bhutan, addressed to their counterparts in other countries. The expedition addressed thousands of meetings. The constant refrain in these meetings was: the nations of South Asia have a shared past, a shared heritage. We are united in our problems as we are united in our immense potential. This makes us natural allies. We cannot wish geography away even if we wanted to. We have already wasted 50 precious years seeing enemy in friends, fighting phantoms and ghosts. The last half century has been one of mutual suspicion, bitterness and conflict. We must work towards a future full of peace and happiness. The coming century beckons us to make a new start, to embark on a new course based on peace not conflict, dialogue not confrontation, healthy cooperation not destructive competition.